Customers can avail from us Pomegranate Seeds that are recognized for their optimum quality. Our expert professionals process the Pomegranate Seeds in hygienic environment in order to retain its properties and freshness. Customers in national and various international markets can count on us for providing quality seeds in high grade packaging materials. 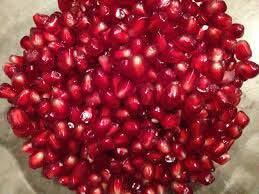 That is why we are a celebrated Supplier and Exporter of Pomegranate Seeds from Telangana, India.